Since our application is going through a complete re-design of both the user interface as well as the application core features we decided to enhance our chat a little as well. 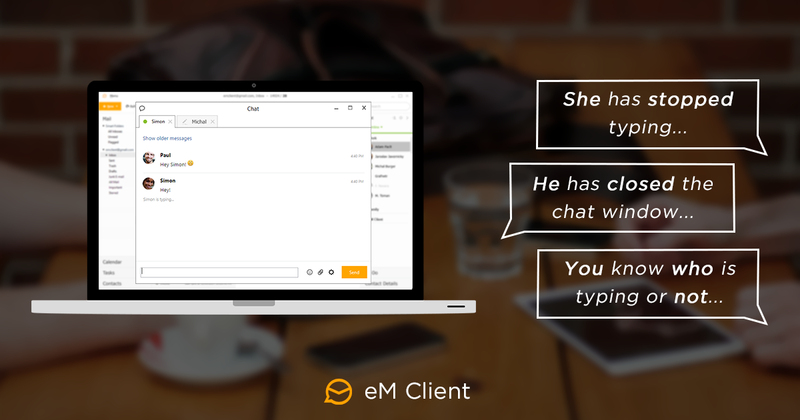 The new eM Client 7 will allow you to see not only if your chat contacts are online, away or offline but it allows you to see if they are typing as well. Not only that, we’re including a couple of new status options while using the chat feature. eM Client can spot the difference if the contact has stopped typing or if he/she closed the chat window as well.